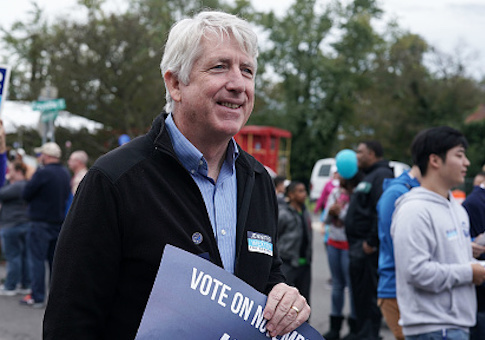 A Virginia school district filed suit against state attorney general Mark Herring (D.) late last month over his office's refusal to allow their staff to carry firearms on school property despite meeting standards for a specialized law enforcement position. In July, Lee County School Board unanimously approved a plan for certain staff to become special conservators of the peace. That would allow them to legally carry firearms on school property in order to supplement the presence of armed school resource officers. The district currently only has officers at 5 of their 11 schools. Herring, however, refused to allow the first applicant who completed the training required under Virginia law, superintendent Dr. Brian Austin, to be granted the designation. "Our kids deserve a safe, secure learning environment when they come to school, and adding guns and armed, unqualified personnel to our classrooms is incompatible with that goal," Herring said in a statement to the Washington Post last summer. "Virginia law expressly limits who may possess firearms on school grounds for safety purposes, and the General Assembly declined to enact bills presented every year from 2013 through 2017 to extend this authority to school teachers and administrators." The school board responded by filing a lawsuit in the Circuit Court of Lee County against the state. Republican Ken Cuccinelli, a former Virginia attorney general who is representing the district in their suit, told the Washington Free Beacon he's confident their lawsuit will succeed. "We think we have a good case," he said. Cuccinelli said the law in question is on the school district's side, and he expects the case to be fairly straight forward. "It fits entirely and rather cleanly within the English language interpretation of the statute," he said. "The Commonwealth is going to have to do some back flips and interpretation to try to get the court to believe that means something other than the straight words in the statute. And that's what they're going to have to do to continue to block us. And all we have to do is pull out a dictionary." He said it ultimately comes down to whether or not the school board has the authority to create a program where their staff are able to qualify for special conservator-of-the-peace status and carry firearms on school property. "The legal question is whether the school board has the authority to enact such a program or not," Cuccinelli told the Free Beacon. "And that's really what the case is going to turn on. And I think the law's pretty clear they can. The attorney general's opinion over a Virginia statutory interpretation question mainly relies on a U.S. Supreme Court dissent. So, I don't think they're in a very strong legal position, and I think they know they're not in a very strong legal position. Ultimately that's for a court to decide and that's what we're going to do. We're going to try to get the courts to allow the school board to proceed with one of it's chosen ways of protecting the children in their charge." This entry was posted in Issues and tagged Gun Control, Ken Cuccinelli, Virginia. Bookmark the permalink.